Lucena City - After robbing a pawnshop in the adjacent city of Tayabas barely two weeks ago, a group of robbers believed to be members of the dreaded “Termite Gang” burglarized a bank along Diversion Road at Bgy. Gulang- Gulang, here, sometime during the holidays, police reported yesterday. Quezon police director, Senior Supt. 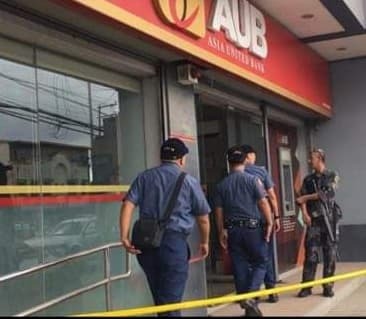 Osmundo de Guzman who personally inspected the crime scene said the amount of cash carted away by the robbers is yet to be determined by the bank management while police probers and Scene of the Crime Operatives are doing a deep investigation on the incident. De Guzman in his report to Calabarzon police director, Chief Supt. Edward Carranza said the city police was informed of the incident at 8:45 a.m. yesterday by personnel of Asia United Bank- Lucena Branch. Probers, upon inspection, learned that the suspects forcibly entered the establishment by digging underground, creating a tunnel and managed to get inside the portion of the bank near the vault, De Guzman said. He said the robbers then destroyed the upper cemented portion of the room where the vault is placed. The SOCO team arrived shortly on requests of Supt. Reydante Ariza, the city police director to do the crime scene processing. During the process, probers recovered two hydraulic jack, a grinder, a flat screw, and blocks of plywood in different sizes. The incident happened despite the constant inspection of the city police and reminders by Ariza to different business establishment owners regarding security measures to prevent the occurrence of robbery incidents. Ariza, a native of Baguio City has been reminding the public to be aware of the presence of Termite Gang whose members are mostly from Baguio. De Guzman ordered Ariza and members of the Provincial Intelligence Branch to do all possible means to have the case resolved as early as possible. It can be recalled that on the morning of December 10, the Unit Trade Pawnshop at Bgy. Angeles Zone 3, Tayabas City was stormed by a group of robbers using the same style carting away more or less P213,803 cash and assorted jewelries amounting to around P500,000.